Hello Friends! Long time no post. Life took over and I had to take care of some things, so I was not able to post. If you are following me on Instagram, then you were able to see my projects for the last few days of the 30 Day Coloring Challenge. I decided to just move forward and I am not going to do a day by day post of what I created. Rather, I will do a wrap-up and post a few highlights. I finished the Enchanted Forest Valentine image, illustrated by Johana Basford. I really learned a lot about my Zig Clean Color pens. I absolutely adore them and will be adding a few more colors to my collection to round it out. 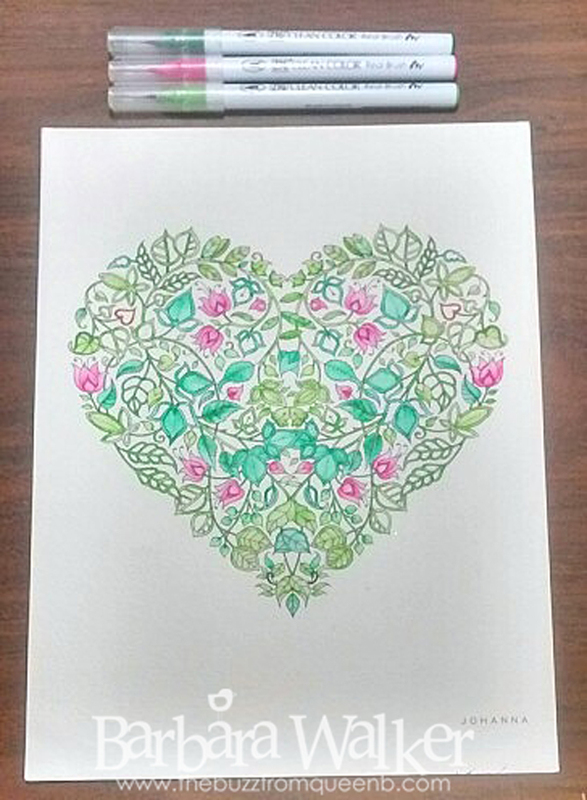 I tend to color more florals and foliage and I find that the set that I initially purchased is sorely lacking on greens. The beauty of the markers though, is that one can dilute the pigment to achieve a much lighter shade than that which is first laid down with the markers. I had a blast watercoloring this image and I decided to have it framed and I'm giving it to my mother. I apologize for the quality of the photo, I took this with my cell phone. Next up is another beautiful image from Power Poppy. 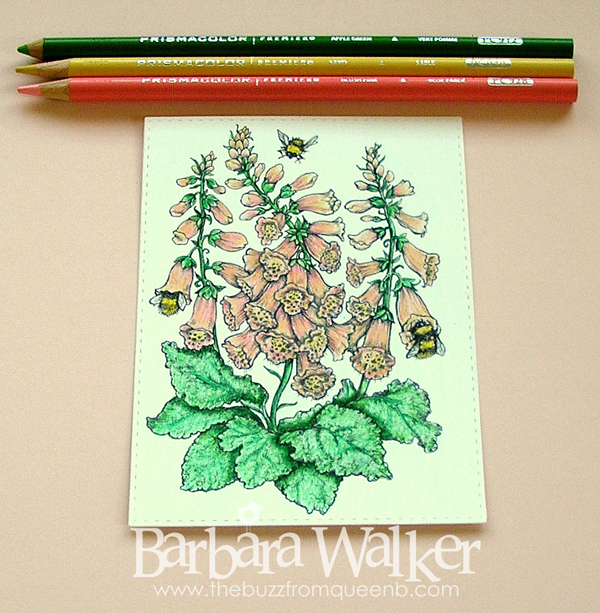 It's the June addition to the Instant Garden, called Bees in Foxglove. I tell you what, Marcella Hawley, just 'gets' me. She knows what tugs at my heart strings and she draws it and I love it! You all must know how I feel about bees. 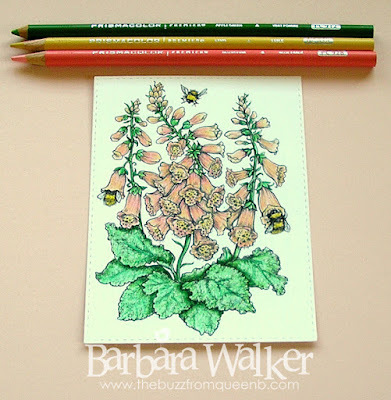 My entire business is centered on The Bee....the Buzz, Queen B, the Hive, Blessed Designs by B,etc...What you may not know is that I also have a love affair with Digitalis or Foxglove. 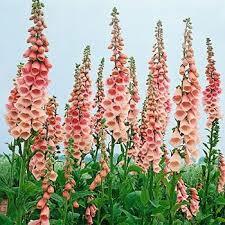 Years ago, when I had an English Country Tearoom, I grew all shades of foxglove on the side of my house. I had a rainbow of colors. I loved watching the bees glide in and back out of the little 'tubes'. So when I saw the new digital image for June, I was flooded with memories of that time. My girls were so small and we would garden and have tea and set out lady bugs to eat the aphids off the rose bushes; I had 22 rose bushes in a flower bed in our front yard and the scent was heady and overwhelming at times, but we LOVED it! I knew I had to add the new image to my collection and I knew exactly what colors I wanted to use for it. One of my favorite digitalis was Apricot Beauty. I love the peachy pinks and soft corals in this variety. The spires grow soooo tall and the flowers are just gorgeous with all those 'freckles' inside. Marcella's attention to detail is amazing. The woman knows how to illustrate flowers! She has perfectly captured the foxglove, right down to the freckles on the inside of the blooms. And just look at those cute little bee butts! Anyway, as I said, I colored this with Prismacolor pencils. I didn't use Gamsol or any type of blending solution, I just used the pencils. I've been seeing some really wonderful pencil work out there in blog land and I want to learn to master a few of the techniques that use only the pencils. When I travel or am at the beach, it's not always practical to have a bottle of solution, so learning these techniques will allow me to color anywhere and achieve favorable results. 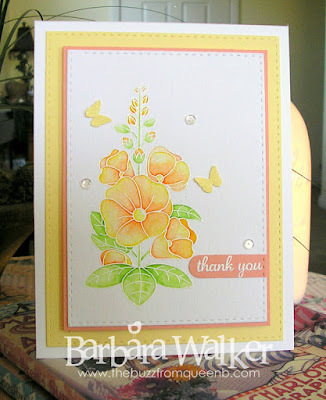 Okay, next up, I watercolored a gorgeous hollyhock image from the Sunshine and Smiles stamp set from Clearly Besotted. Hollyhocks are another favorite of mine. I also grew a few of these, but they were notorious for attracting grasshoppers and I REALLY don't like grasshoppers...at. all. I see one and I'm done with gardening for weeks. So, when I saw this stamp set featuring not only a sweet sunflower(another favorite) but also a lovely hollyhock, I knew I had to have it. I used my Zig Clean Color pens for this one. LOVE those pens, ya'll! Just love 'em! I stamped the image onto the smooth side of my watercolor card stock this time. I rarely, if ever, use the smooth side. I like the textured side so much. But I saw a video featuring this set watercolored with the Zig pens and the artist used the smooth side and I loved the way the colors blended so effortlessly. I have to say, I am pleased with the way this one turned out. As usual, I embossed the image with white fine detail embossing powder. After the image was completely dry, I added a good coating of clear Wink of Stella on the blooms and the bitty butterflies. This one is going into my Card Boutique, which will open up again in a few weeks. I created this card in honor of Kathy Racoosin the wonderful host of the 30 Day Coloring Challenges. She is amazing. So gracious and kind. She commented on each of our posts with words of encouragement, cute emojis and lots of warmth and love. I truly appreciate all that she did to pull this challenge together. She creates and posts every day, right along with us. She had giveaways and tons of video tutorials. Thank you, Kathy! I look forward to the next one! And that is it for my Wrap Up! Thank you so much for visiting today. I appreciate it! I elected to not include a supply list this time. If you have any questions about an item, please post it in the comments and I will respond. Thank you. Hello Barb! Thank you for visiting my blog. I love your coloring of the Floxgloves. I totally agree about Marcella's ability to create such beautiful details with her floral images. I want all of her stamps...baby steps, baby steps. Have a blessed day and happy coloring. The 30 Day Challenge was so needed to study all of my mediums as well! I need practice with all of them! I guess I missed the holyhock post in IG it's so sweet! But Marcella's got my vote for the best illustrated perenials! Nicely done Barb! Beautiful! It is so wonderful to see you posting after your brief hiatus! I know real life gets in the way, but I missed you after getting spoiled by daily posts. This post just appealed to me in so many ways. Not only do I get to see some fabulous projects, I got to learn a little bit more about you with the tearoom and your love of particular flowers. Thanks so very much for sharing, Barb! I adore every photo you've shared here. Your talent is tremendous!